Launched in 1999, the Acid hand-rolled premium cigar line has proven to be an industry hit with their flavorful South America botanical cigar realms. Each of these premium cigars are handcrafted from the finest selected tobacco, infused with rich botanical oils, and spices all produced at the Drew Estate factory in Esteli, Nicaragua. Inspired by artist Scott “ACID” Chester all Acid Cigars are packaged in a mixture of graffiti, urban, and industrial artwork design, making them one of the most unique brands never before seen in the cigar industry. This combination provides a one-of-a-kind smoking experience that has rapidly created a cult following over the past decade. 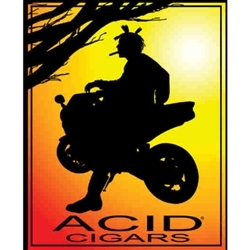 Guaranteed to provide an enjoyable smoking experience that’s sure to last, Smokers Discounts offers Acid premium cigars in numerous varieties of sizes and flavors. Check out all the styles available here for discount prices. Call us for more details!